April 13, 2017 – Stefania Moehring, ULA’s Commercial Crew Program integration lead, received NASA’s prestigious Silver Snoopy Award for outstanding work and dedication to the human spaceflight program. 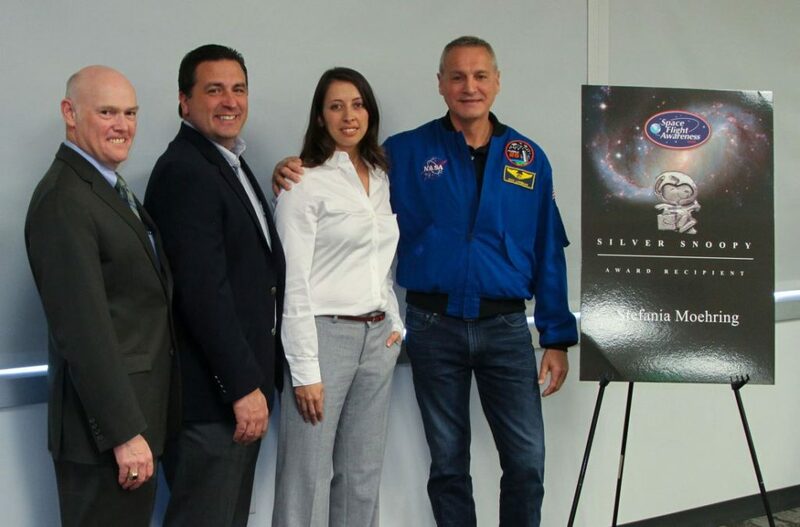 Four-time Space Shuttle NASA astronaut Richard Linnehan presented the award. An astronaut always presents the Silver Snoopy because it is the astronauts’ own award for outstanding performance, contributing to flight safety and mission success. Fewer than 1 percent of the aerospace program workforce receives it annually, making it a special honor to receive this award. ULA’s Atlas V rocket will launch astronauts to the International Space Station atop Boeing’s CST-100 Starliner spacecraft beginning in 2018, bringing human spaceflight back to U.S. soil as part of NASA’s Commercial Crew Program. Moehring is a leader and key contributor for the development of safety and reliability products that will demonstrate the Atlas V launch segment meets or exceeds NASA’s human spaceflight requirements. She’s developed a structured, logical analysis methodology and products used to identify and assess risks associated with all aspects of the Atlas V launch system. Many safety elements are built into the systems, including the Emergency Egress System (EES), which recently completed final testing EES at ULA’s Space Launch Complex 41 at Cape Canaveral Air Force Station. The egress cables are situated on level 12 of the Crew Access Tower (CAT), at which astronauts will board the Starliner capsule, 172 feet above the Space Launch Complex 41 pad deck at Cape Canaveral Air Force Station. The EES will allow astronauts and ground crew to evacuate tower to a landing zone more than 1,340 feet from the launch vehicle. The EES is modified from a commercial zip line system originally created for recreational use.